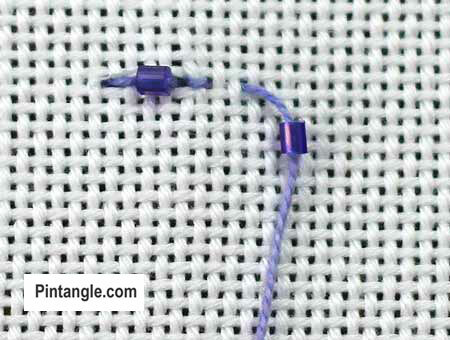 Beaded Back stitch is a line of back stitch that is simple and quick to work as you add a bead to every second stitch. It makes sense that you need to know how to work regular back stitch before embarking on the beaded variety. You can find instructions on how to work Back stitch here. 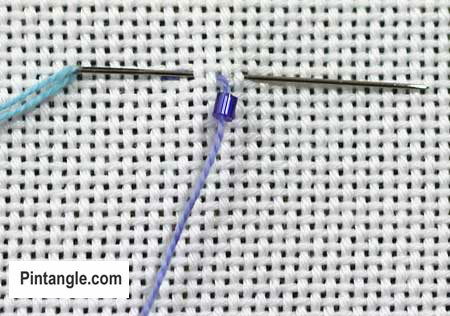 The trick with hand embroidered beaded stitches is to use a #26 tapestry needle. This size needle is fine enough to thread a bead, yet the eye is wide enough to take a perle # 8 thread. This means you can embroider and add beads easily as you work. In Beaded Back Stitch every second stitch beaded. Bring the thread up from the back of the fabric on the line that you want to embroider. Make a small backward stitch through the fabric as you would regular back stitch. Bring the needle through the fabric a little in front of the first stitch but still on the line. 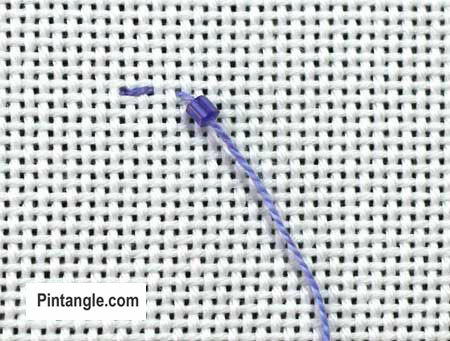 Thread a bead and make the second stitch by inserting the needle down into the hole made by the first stitch. 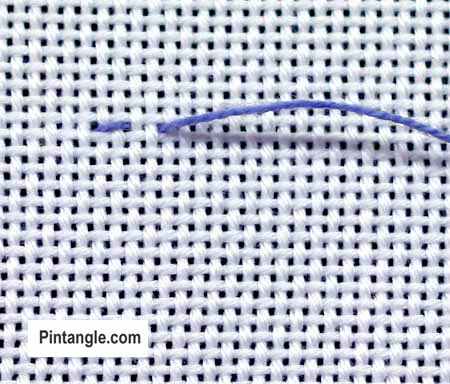 Take a bite of the fabric, bringing the needle out a little in front of the second stitch as illustrated. Pull your thread through. Make the next stitch a regular back stitch. When you bring your needle through the fabric thread another bead on. Repeat this pattern of beaded stitch , un-beaded stitch, beaded stitch, un-beaded stitch along the line. The finished line is very decorative. 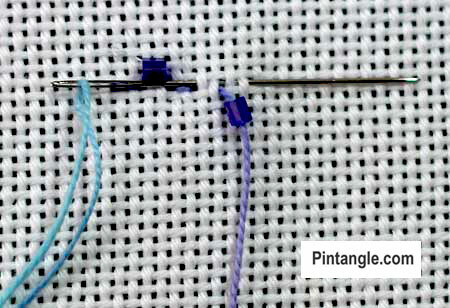 Beaded Back stitch makes a good edging stitch for items such as needle cases or pin cushions. 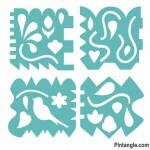 Of course it is ideal for contemporary crazy quilting too! As I have said this example of Beaded Back Stitch is where every second stitch beaded but the pattern of one back stitch and one beaded back stitch can be changed to create interesting patterns and designs. For example you could have two back stitches and one bead or 3 back stitches and 1 bead or 2 beads and back stitch I am sure you get the idea. Patterns can be worked line upon line – such as in pattern darning, to create many interesting beaded embroidery variations. That’s a great look, the beaded back stitch. Thanks for reminding me, excellent tutorial too. I mean my brain, of course, not my computer! LOL Allie I thought that is hat you meant! thank you for this stitch. i will try this on my crazy patchwork. i am looking forward to your book. will use in my TAST excercises. I got my templates In the mail today. So excited to try them out.